I’ve been getting in touched with k-hiphop because of MINO so most of the songs in here are just that. There are only a couple of songs in this playlist because these are all I listened to this past December. I know that I get quite obsessive but seriously, they’re the only songs I listened to and almost always on repeat at that. 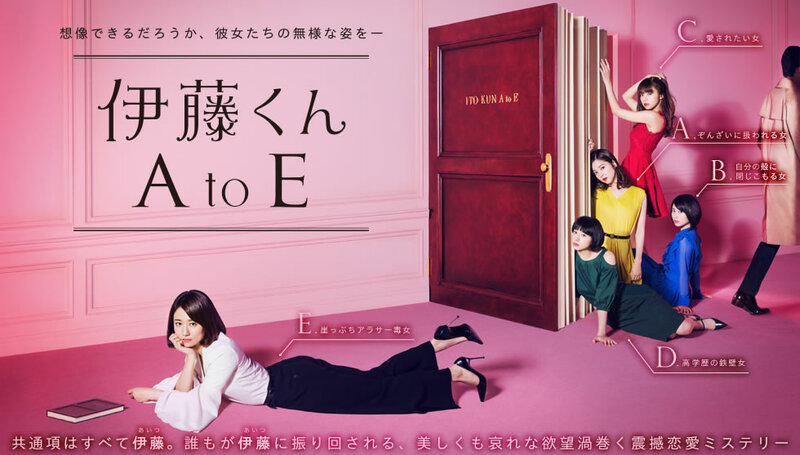 In my neverending quest to watch everything Okada Masaki is in ever, I’ve come across the jdrama Ito-kun A to E. I was intrigued by it because he’s in the film of the same name scheduled to premiere in 2018. When I discovered the existence of said drama, it hasn’t aired yet and so I filed it in my mental list of Okada Masaki dramas to watch. Then early last week, while I was casually checking Netflix for their newly added shows, I saw The Many Faces of Ito. I thought it sounded familiar and as I was always desperate for good jdramas to watch, I checked it out and lo and behold, it’s Ito-kun A to E! So I immediately queued up the first episode. And finished the entire drama in less than a 24-hour period despite a hectic work day, forgoing sleep because who needs sleep? Detailed thoughts on this wonderful drama below the cut! I’m doing weekly round-ups now, which will include any media I consumed for the past week, from Monday to Sunday. (This edition though is actually from Sunday to Sunday because I’m changing schedules. I realized that I really can’t post anything when I’m in the province during Sundays and I tend to do most of my watching then so it’d be better for the week to start on Mondays.) I’d be glad if you end up getting some recommendations but I’m only doing this as a form of a media journal (to make it easy to write reviews later on). And fine, an actual journal too. Here goes! Hahaha, I didn’t know this blog could also be a ~beauty~ or ~lifestyle~ blog but I guess everything goes now! I just wanted to share this product (PROMISE, THIS IS NOT A SPONSORED POST) because I was sooooo legitimately happy about it. Now, a bit of a background. Gross or whatever, but I’ve always had a ~forest~ situation on my underarms. Let’s say I shave this morning. By the next morning, there is evident regrowth already. I AM NOT JOKING. And I know, I could just wax or get my underarms threaded or pluck them but 1) shaving is so much easier and faster, 2) I hate tweezers, and 3) I hate spending money ALL THE TIME for it. So naturally, my armpits ended up dark with chicken skin, and of course, the hair was so much thicker. This was really saddening because I have a quite fair skin so to have such a vast difference in skin tone is just disheartening. Anyway, I finally invested in getting my pits treated to stop the hair growth. I know, let’s all be natural and healthy and ~you don’t have to shave~ and all the feminist things BUT it’s my body and I really feel better when my underarms are hairless. I’m not just being forced by society that it looks better if it’s “clean” and all that. I really don’t like hair in there. And it’s my body so okay. I’ve been getting the Diode Laser Underarm Hair Removal Treatment at Skinstation for Filipinos out there who want to do the same. It’s expensive, yes, but I got it for a deal (from PhP 1500 per session, it became PhP 500, I think [that’s USD 30 to USD 10) and I’ve been very happy about it. I’m just on my fifth session and my hair follicles are very active and strong so I’m nowhere near done. But I’m loving how the hair grows back sooooooooooooooo slowly nowadays and there’s so few of them too! So I stand by this treatment. With the hair kinda managed, I still have my dark underarms and chicken skin situation. Skinstation has been offering me their Vitamin C ointment/lotion/emulsion but I didn’t want to spend more bucks on it. Two weeks ago, I finally started putting Vitamin C on my underarms every morning after taking a shower and drying myself off. I figured, if it’s okay for my face, it should be okay for my underarm, right? Yes, I’ve been using my It’s Skin Power 10 Formula VC Effector on my underarms and with just two weeks of religiously using it, I’ve noticed much improvement! I don’t have photos because duh, I’m embarrassed of my underarms. But the chicken skin has abated and is mostly gone! It looks a bit brighter too and I might try exfoliating it soon too. Seriously, I now feel like applying it at night too to hopefully increase its power? It doesn’t break the bank too! I got mine for PhP 390 (USD 8) from Althea. It’s not actually cheap but this small bottle goes a long way. I also use it for my face as my Vitamin C active so its duality in purpose feels like it’s worth the money. Sooooo, that’s it! Hope it works for you too if ever! With the aim to review every kdrama that I’ve seen this year, here’s the review for Falsify! I’ve pretty much talked about it during my weekly round-ups so this will be just elaborating points I’ve brought up then into a hopefully more cohesive review. Go under the cut for my thoughts on Namgoong Min’s second drama this 2017! I’m doing weekly round-ups now, which will include any media I consumed for the past week, from Sunday to Saturday. I’d be glad if you end up getting some recommendations but I’m only doing this as a form of a media journal (to make it easy to write reviews later on). And fine, an actual journal too. Here goes! The takeover is real. Look at my November tunes and you’ll see that they are mostly kpop. Good lord, I cannot deny it anymore, I’m in too deep once again. Hahaha! I always dig Dagny’s songs so I’m so glad she dropped a new track. HONNE is a new discovery care of Sarah and I’m still trying them out but so far, I like what I’ve heard. Some songs in here were introduced to me by my sister such as “Havana” and “Gucci Gang”. What have you been listening to the past month? Do share them!